This section takes you through the most common elements of the user interface. Throughout this user guide, you will learn about each view and toolbar, and how to use them. 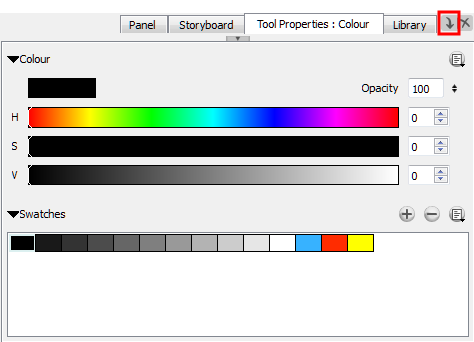 Storyboard Pro has several views and toolbars. The top toolbars are available at the top of the interface and the different toolbars are in individual windows. This is a complete list of the views and toolbars available in Storyboard Pro. The Stage view has a status bar at the bottom that is displayed by default. You can hide the status bar through the Preferences panel. In the Options section, deselect the Show Status Bar option. ‣ In the status bar, click the Zoom menu and select a zoom level. ‣ Camera Overview to display the current panel from the camera`s point of view. You can choose to display a grid that appears in the Stage view. The default grid is a standard 12 field animation grid, but you can choose another. You can also access the grid from the top menu by selecting View > Grid > Show Grid or press [Ctrl]+[G] (Windows) or [⌘]+[G] (Mac OS X)—see Drawing to learn more about the grid options. You can define your own safety limits in the Preferences dialog box—see User Interface Preferences - Camera Tab. The 4:3 Safety button shows or hides the TV safety zone and the centre of the camera frame for a regular 4:3 resolution. If you are working on a widescreen project, for example, you can easily plan in advance the conversion of your project to a TV format. This way, you can create your project to fit both resolutions. You can also access this feature from the top menu by selecting View > Extras > Show 4:3 Safe Area. The 4:3 Area button shows or hides the 4:3 resolution zone without the centre of the camera frame and TV safety zone. You can also access this feature from the top menu by selecting View > Extras > Show 4:3 Area. The Camera Mask button shows or hides a black mask around the scene’s frame to avoid seeing anything outside the Camera frame. This is handy when you are setting up the scene as it allows you to see the scene’s composition better. You can also access this feature from the top menu by selecting View > Extras > Camera Mask. The Camera Label button shows or hides the IN and OUT indications in the top-left corner of the camera frames, on the start and end position of a camera move for the current panel. When the Camera tool is selected, the labels switch to alphabetical labels that clearly show the different camera keyframes—see Animatic. 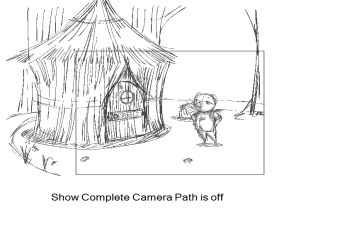 The Complete Camera Path button displays all the related camera keyframes and paths in a scene. When this button is deactivated, the Stage View only displays keyframes that are contained in a panel. You can also access this feature from the top menu by selecting View > Show Complete Camera Path. The Reset View button resets any panning, zooming or rotation done in the Stage View and returns the display to its initial settings. This option is also available from the top menu. Select View > Reset View or press [Shift]+[M]. NOTE: This option works with the Point of View Menu. The Reset Rotation button resets any rotation done in the Stage View and returns the display to its initial rotation settings. This option is also available from the top menu. Select View > Reset Rotation or press [Shift]+[X]. When rotating 2D layers in 3D space, you can reach a situation where the Stage View is no longer perpendicular to a Drawing layer, making it impossible to draw on it. Use this option to make the Stage View perpendicular to a selected drawing layer, allowing you to draw on it. NOTE: This option is used when working in 3D space—seeWorking in a 3D Space. The Point of View menu lets you determine the level at which the current position of the Stage View (zoom, pan and rotation) is remembered when you are flipping through the panels. • Project: Keeps the zoom, pan and rotation values of the Stage view for the panels of the project. • Scene: Keeps the zoom, pan and rotation values of the Stage view for the panels that are part of the current scene. • Panel: Allows every panel of the project to have its own zoom, pan and rotation value. These options are also available from the top menu. Select View > Point of View Mode > Project Level, Scene Level or Panel Level. NOTE: The current Point of View mode will also affect the different Reset View commands’ behaviour as they will reset according to the Point of View mode. The Zoom menu lets you enlarge or reduce the Stage view display. If you want the camera frame size to always match the size of your Stage View, select the Fit to View option. Click the corner of the button and select a zoom level. You can also use the default keyboard shortcuts  to zoom out and  to zoom in. 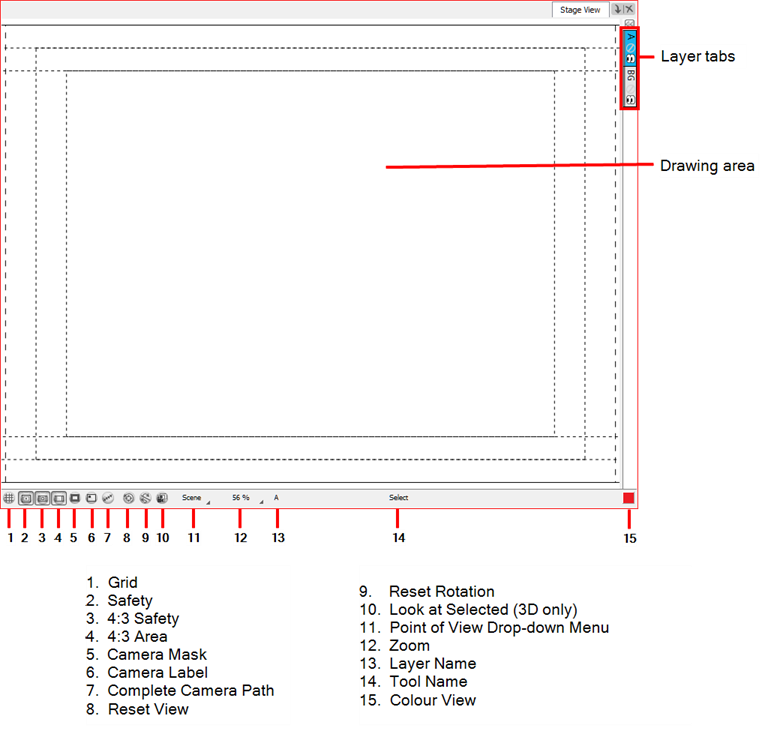 The Layer Name field displays the name of the selected layer of the current panel. The Tool Name field displays the name of the selected tool. If you override a tool using an overriding keyboard shortcut, the tool’s name turns red—see Drawing. The Coordinates field shows the coordinates of the cursor while in the Stage iew. The Colour Picker square at the bottom-right of the Stage View displays currently selected colour in the Colour View . You can click the colour pot to open the Colour View and select a new colour. This is where you draw, animate layers, and create camera moves, as well as preview your storyboard. It is the main space of the default Drawing workspace. In the default workspace, the Thumbnails view is at the bottom of the interface. The Thumbnails View displays all the panels of your project in chronological order. You can use this view to navigate through your storyboard, rearrange panels and scenes, and select the panel of your choice to be displayed in the Stage view. By default, it is not possible to draw in the Thumbnails view. However, you can change this behaviour in the Preferences dialog box. ‣ Select Edit File > Preferences (Windows) or Storyboard Pro > Preferences (Mac OS X). By default, the Thumbnails view does not have browsing buttons. But you can change this setting in the Preferences dialog box. In the Thumbnails View section, select the Keep Current Panel Centred option. For more information about drawing your storyboard panels—see Drawing. When your scene is collapsed, you can still work in the Timeline. However when you select a panel, the entire scene is selected, not just one panel. This means that you cannot work only on a single panel in the Timeline; you must expand the collapsed scene first. 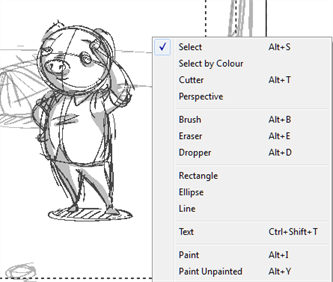 The Tools toolbar contains all the main tools you will use while working in Storyboard Pro. In the default workspace, this toolbar is displayed vertically on the left side of the interface. Go to First Frame of Selection Automatically places the playback marker at the beginning of the panel selection. This selection can be one or many panels. In the Timeline view, you can see the red marker positioning itself at the first frame of the first panel of the selection. Select Play > Play Selection. Enables dynamic camera movements during playback. NOTE: When animating storyboards in the 3D space, with 3D or 2D layers, the Stage view only displays an approximation of that panel and may not be completely accurate. Use the Camera View to accurately see what the camera captures in the panel—see Previewing the Panel with the Camera View. 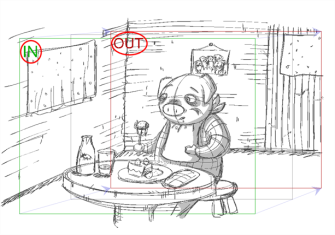 • First Panel: Selects the first storyboard panel and places the playback marker at the beginning of this panel. • Previous Scene: Selects the scene preceding the current one and places the playback marker at the beginning of that scene. • Previous Panel: Selects the panel preceding the current one and places the playback marker at the beginning of this panel. Default keyboard shortcut: [A]. • First Frame: Places playback marker at the first frame and selects the first panel of the storyboard. Default keyboard shortcut: [Home]. • Previous Frame: Use this to go to the previous frame of the storyboard. Default keyboard shortcut: [,]. • Next Frame: Use this to go to the next frame of the storyboard. Default keyboard shortcut: [.]. • Last Frame: Use this to place the playback marker at the last frame and select the last panel of the storyboard. Default keyboard shortcut: [End]. • Next Panel: Use this to select the panel next to the current one and place the playback marker at the beginning of that panel. Default keyboard shortcut: [F]. • Next Scene: Use this to select the scene next to the current one and place the playback marker at the beginning of that scene. 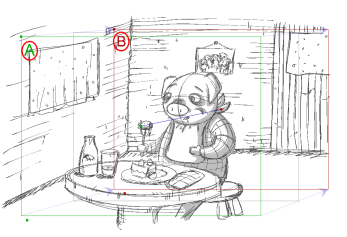 • Last Panel: Use this to select the last panel of the storyboard and place the playback marker at the last frame. • Go to Scene: Use this to specify to a scene to go to in the storyboard. • Go to Frame: Use this to go to a specific frame of the storyboard. Refer to the Animatic chapter to learn more about frames and timing. This section of the Panel view is where information, such as the duration of the current panel, name of the current panel and name of the scene in which it is part of is displayed. It is possible to edit some of the fields—see Script and Panels. It is possible to add voice annotations to a panel. 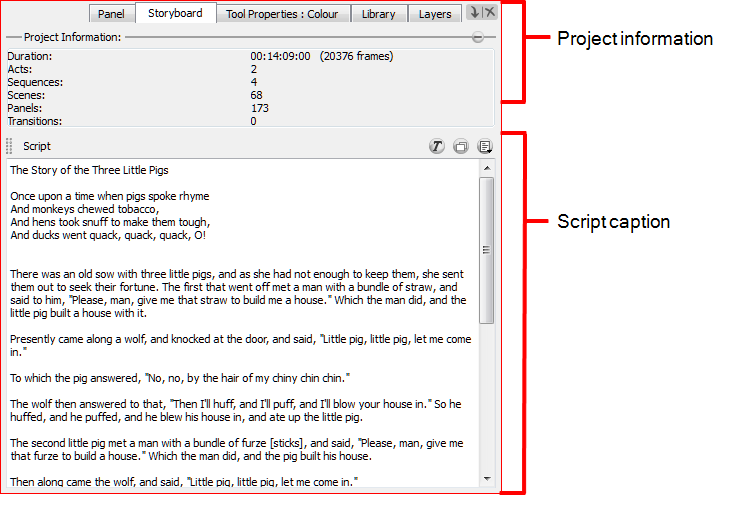 This collapsible section is used to control and edit these annotations—see Voice Annotations. • Dialogue: Type or copy/paste dialogue from your script that occurs during this shot in the current panel. • Action Notes: Type or copy/paste notes related to the action occurring in the panel. • Notes: Add anything relevant about the current panel or the shot it represents. For example, the crew working on the shot, required props, ambient sounds, continuity notes or required equipment to complete the shot. You can use the Caption Menu button to access the commands related to your caption fields, and the Text Formatting button to display a toolbar to format your text. 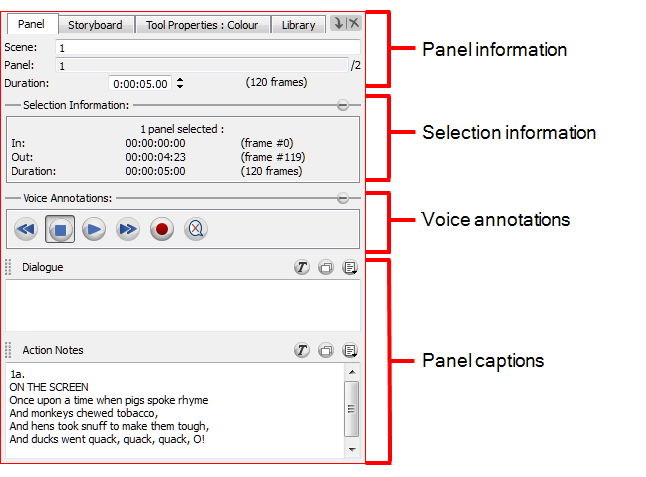 Refer to the following chapters for more information about using the Panel view: Script and Panels, Animatic, and Storyboard Supervision. This collapsible section of the Storyboard view is where information such as the duration, number of acts, sequences, scenes, panels, and transitions is displayed. You can click the Collapse button to hide the section and leave more room for the Script caption field. Once it is collapsed, you can click the Expand button to display the entire section again. Like panel captions, storyboard captions are fully customizable. The difference is that the information that you store here is relevant for the entire storyboard, rather than for a specific panel. This default caption field is specifically there for your script. You can use the Caption menu to access the import commands and the Text Formatting button to display a toolbar to format your text—see Script and Panels. ‣ In the Panel view, click the View Menu button and select Colour. The Add Colour button lets you creat a new colour swatch from the current colour. Click the Add Colour button to add a new swatch to the bottom of your colour list or swatches. The Colour View menu lets you access commands related to the Colour view, such as creating and deleting colour swatches, changing the display mode, import and export colours, and create new textures. For more information on colour, see Adding Colour. The top menu contains most of the commands. Depending on the view you are working in and the selected element, some commands are available and others not. The top menu is always located at the very top of the user interface. Some views have their own menu containing commands specifically related to that view. 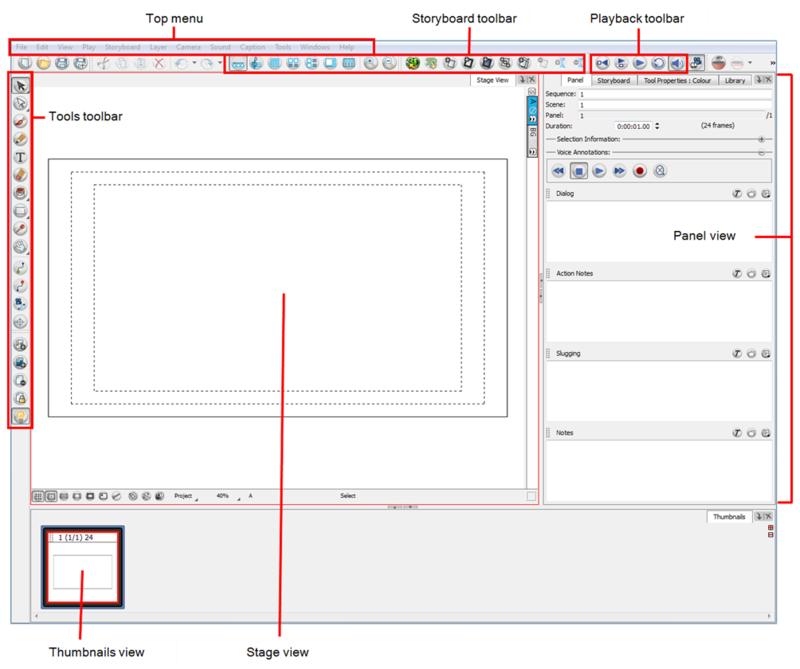 ‣ In the top-right corner of the Panel, Storyboard, or Colour view, click the View Menu button. Each view has a contextual menu containing commands for recurring actions. This menu is accessed by right-clicking (Windows) or [Ctrl]+click (Mac OS X) anywhere in a view.